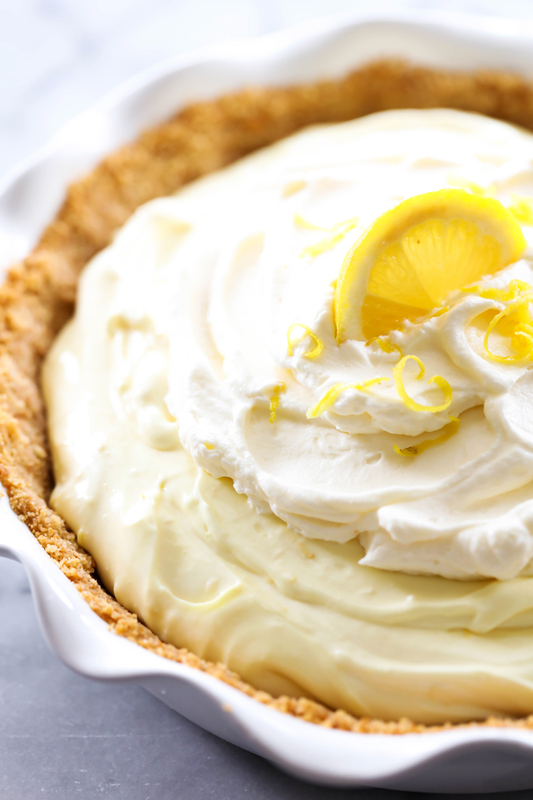 This Lemon Cream Pie has the perfect hint of lemon for a light refreshing taste that is balanced by a creamy silky base. It has a vanilla wafer crust that is a delightful compliment. This pie is adored by all who try it! Temperatures have been getting warmer (knock on wood) and it has begun to feel like spring is right around the corner… finally! This has been one of the longest winters. I say that because the amount of times it has snowed more than just an inch or two have felt overwhelming. With spring in the air and Easter approaching next month I wanted to do a spring recipe. 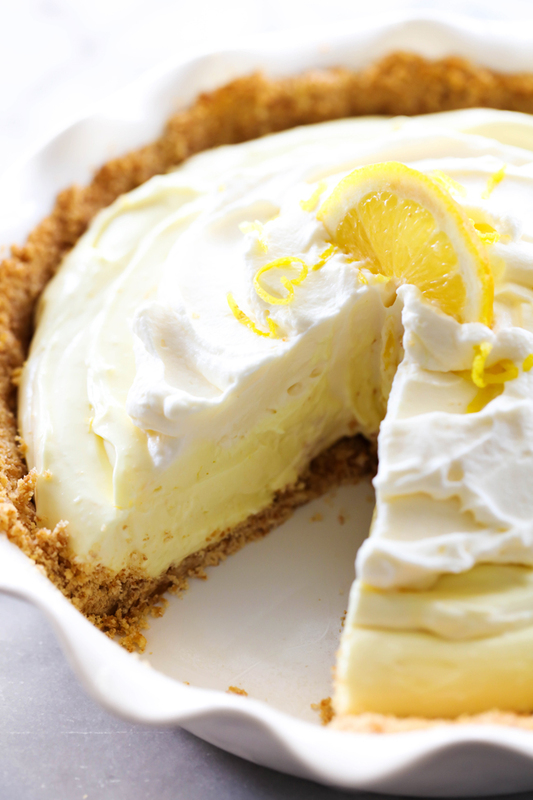 This Lemon Cream Pie really hit the spot and instantly became one of my new favorite pies. The lemon flavor is not at all overwhelming but rather subtle and refreshing. The cream really balances it out and the vanilla wafer crust is the perfect crust for this particular pie. This is a must try pie! It is simple and absolutely delicious! Blend vanilla wafers in a food processor. In a small bowl combine waffer crumbs, butter and sugar and mix well. Press into a 9 inch pie pan. Bake at 375 degrees F for 6-8 minutes until edges turn slightly golden brown in color. Let cool on counter top. In a small mixing bowl beat cream for two minutes, and then add powdered sugar and beat until stiff. Set aside. 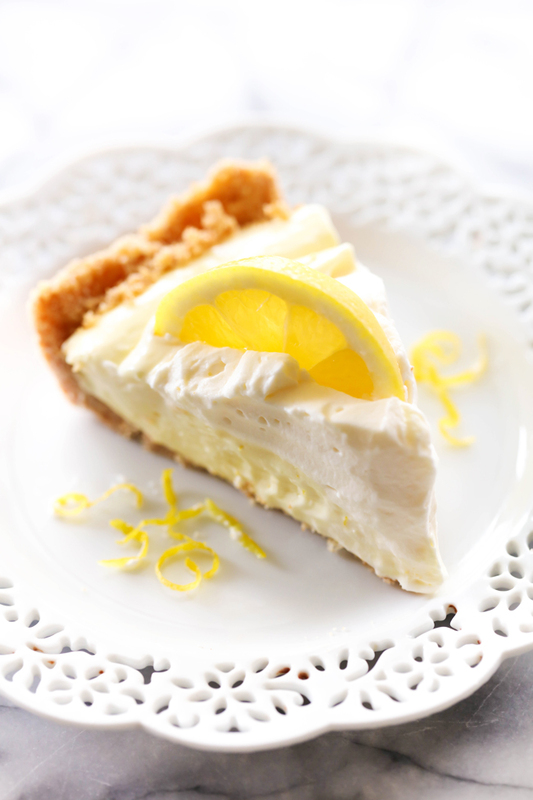 In a large mixing bowl, combine cream cheese, sweetened condensed milk, lemon juice and lemon zest. Beat in high until creamy and smooth. Add 4 drops of yellow food coloring if you desire. Dear Nikki, I truly appreciate your work and this beauty is definitely on my menu this weekend ! Thank you so much ! This is an awesome dessert- light in texture but rich in flavor! Easy to make! I could only get mini wafers - how many should I use? 12 oz of cream cheese, 14 oz of sweetened condensed milk, and 1 1/4 cup of whipping cream whipped up really made for a lot of filling. We could barely taste the lemon through all that, and the filling really filled up the pie!!! It was hard to put more whipped cream on top of that. Did you use a 9 in pie tin? We did, and it couldn't hold the filling. I think it needed lower amounts of the other filling ingredients except the lemon, to help the lemon stand out.